With every Capo di Monte SOLD WE SHALL DONATE €1 TO DR KLOWN. The volunteer clowns of Dr Klown NGO visit EVERY CHILD, EVERY WEEK to bring a moment of relief from pain and stress to all kids in the pediatric wards at Mater Dei Hospital. 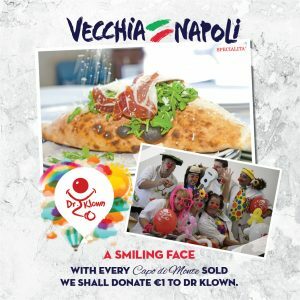 The management and staff of Vecchia Napoli are supporting Dr Klown with €1 for every Capo di Monte pizza you enjoy!